Florida truck drivers endure long service hours and strict deadlines to meet the demands of their job, transporting goods to over 85% of the state’s communities, according to the Florida Trucking Association. While many of these vehicles carry an average weight exceeding 10,000 pounds and arrive at their destination without incident, accidents arising from negligence do occur. Truck accidents in Port St. Lucie are palpably destructive, sometimes leaving victims with critical injuries and massive medical bills. Unfortunately, surviving such a traumatic event is only part of the battle, as parties with financial interests will become legally involved. 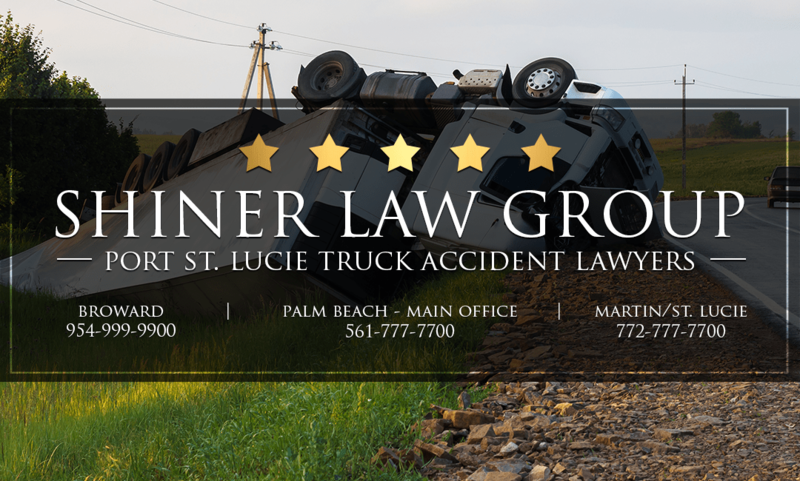 If you or your loved one has been injured in a Port St. Lucie truck accident, contact an experienced truck accident attorney for a free consultation, as you may be entitled to financial compensation. Truck companies and their insurance providers will dispatch an emergency response team within hours of an accident to recover critical evidence and reduce financial liability. These efforts ultimately serve to undermine and take advantage of unrepresented parties in legal proceedings, which makes representation by a Port St. Lucie truck accident attorney imperative. Most tractor-trailers in Florida are owned by third parties that offer different coverage options for damage to your vehicle as opposed to compensation for your injuries. Certain policies combine property damage and bodily injury under Combine Single Limit (CSL) coverage. Separate coverage for bodily injury is referred to as Commercial Liability Coverage, which covers damages not insured by a victim’s Personal Injury Protection (PIP). In the state of Florida, the statute of limitations for a truck accident is four years, and two years when a wrongful death is involved. Florida truck drivers can be well trained but violating safety regulations and participating in negligible activity increases the risk for any truck-related accident. Overloaded or unsecured cargo, inadequate maintenance, inebriated driving, inflated schedules, prolonged service hours, and insufficient training are primary causes of truck accidents. Truck drivers are required to maintain logs that document their inspections, hours of service, and other trucking activities; however, negligible drivers may alter these documents to avoid liability. Securing legal representation gives truck accident victims the benefit of obtaining video footage, police, medical, and accident reports, and other relevant evidence that may reveal inconsistencies in the driver’s logs. Successfully prosecuting a truck accident lawsuit rests on the quality of evidence, such as skid marks or road scuffs, which can disappear within hours of the accident taking place. Having the benefit of a Shiner Law Group attorney means that evidence will be gathered quickly, examined, and preserved to help build the most compelling case. We ensure your claim is trial ready by working with a network of accident reconstructionists to identify the appropriate defendants and secure the strongest financial recovery package. Our law firm has fostered a positive client experience by successfully representing Port St. Lucie truck accident victims and their families for over 15 years, recovering millions of dollars in settlements and verdicts, because we aggressively pursue the best results to facilitate a healthy recovery.